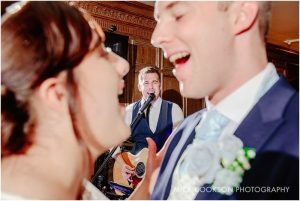 With prices starting from as little as £495 theres something for every budget, available as a solo act, party duo or even backed by a full live band! If you’re not sure which package is for you contact Alex and arrange a no obligation pre-booking consultation* or to arrange a call. *(within 30 miles of Blackburn, Lancashire). Whether it is an all day entertainment package, a wedding ceremony / afternoon performance or a full evenings package with disco, Alex can tailor a programme to suit your requirements with years of experience working on literally 100’s of amazing weddings! Check out the reviews section to see why others would recommend him. For more information feel free to get in touch using the booking enquiry form. If you haven’t already why not have a look at the Frequently Asked Questions page. All bookings can be secured with just a 20% deposit. Face to face consultations (within 30 miles of Blackburn, Lancashire). Unlimited prompt communication and guidance via phone, email and social media. 24 / 7 Access to the My Bookings area where you can manage all aspects of your booking and find useful information. Access to the interactive Guest Requests system allowing guests to login and submit requests for both live and disco sets direct to your booking which you can then approve. Alex on hand to coordinate and manage your day alongside the venue and the other suppliers on your wedding day. Alex’s first class team working behind the scenes to make sure your day runs smoothly and professionally. Top specification Audio & Lighting Equipment suitable venues large and small for up to 400 people (for larger events we can recommend or work with a 3rd party AV company). Multiple PA Systems to cater for multiple sound setups where applicable (No disruption when moving between Ceremony / Afternoon Reception / Wedding Breakfast) as well as battery powered setups ideal for outdoor parts of the day. Use of Wireless Microphones for speeches (if applicable). Exclusive discounts on additional hire services through our events company FAB Events. For more information on the solo packages see the information below and click the links in the package for more details on the various parts. My Bookings Area Access and Guest Requests System. Wedding Host / Toastmaster for the speeches and wedding breakfast. Would you like Alex to perform a laid back performance through your wedding ceremony and sing you down the aisle? This can be added to any package featuring live daytime entertainment from as little as £100. View more information on the wedding ceremony package and view videos of previous ceremony performances. 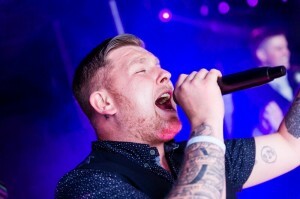 Alex’s brother, Lewis Birtwell, is also a renouned entertainer and great vocalist. Lewis can join Alex for the evening packages to give an added dimension and create an electric atmosphere. For more information on the duo options available see the information below and click the links in the packages for more details on the various contents. Alex is proud to reveal his live band option ‘Rapped Up’, with a wealth of experience having played at various functions world wide. Why not add the WOW factor to your entertainment package. 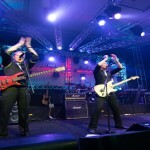 Get a similar repertoire as the Deluxe duo but backed by a live band! For more information on the band packages see the information below and click the links in the packages for more details on the various package contents. * Packages shown include the 5 piece band with a lighting & sound setup for upto 400 people, for larger events an 3rd party AV specialist will be required which we can arrange if required. 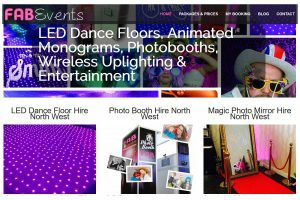 Alex is also a Director of the FAB Events who hire stunning LED Dance Floors, Photobooths, Animated Monogram Packages and Wireless Uplighting. If you book any entertainment package with Alex it will entitle you to exclusive discounts on all of the above services not only bringing overall costs down but ensuring all aspects are managed professionally and from one point of contact. Most wedding and corporate venues require that external contractor’s hold valid insurance before being allowed to work on site. Alex has full public liability insurance (to the sum of £5 million) and all equipment is covered by valid PAT tests. All current certificates will be provided along with a full written booking confirmation upon receipt of a booking deposit. All prices that are listed on this site are subject to a 50 mile radius of Blackburn, UK. Feel free to look in more detail at my local coverage areas. Alex will gladly take bookings further-a-field both nationally and internationally however additional travel and accomodation expenses may be required, please enquire for more details.